Nokia has launched three new advanced feature phones with touchscreens offering a "smartphone-like" experience, the company said on Wednesday. Nokia is trying to make the low end of its portfolio more competitive: During the first three months of 2012 it suffered not just because slow sales of its Windows and Symbian-based smartphones, but also because its feature phone portfolio hadn't kept up with the competition's. The company needs to do a better job with the feature-phone business, CEO Stephen Elop said during a conference call announcing the first quarter results, and vowed to launch full touch products. 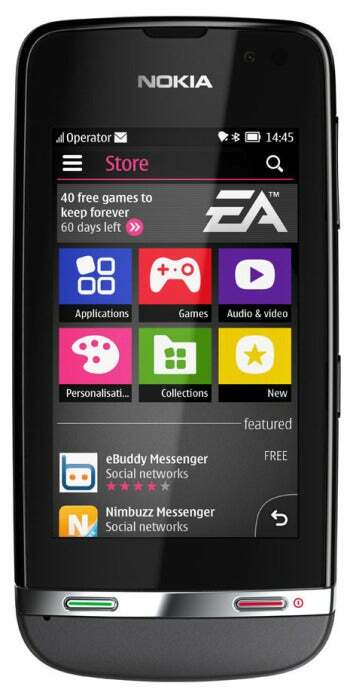 Elop has kept that promise, adding the Asha 305, Asha 306 and Asha 311 to Nokia's portfolio. All are based on the S40 platform. The Asha 305 and Asha 306 both have a 3-inch screen, a 2-megapixel camera and GPRS connectivity. In addition, the Asha 305 has Nokia's Easy Swap Dual SIM technology, which allows SIM cards to be swapped without opening up or turning the phone off, according to Nokia. The Asha 306 also has Wi-Fi, which at US$93 before local taxes or operator subsidies is Nokia's cheapest WLAN phone to date, it said. However, the Asha 305 is the cheapest of the three new phones at $85 before local taxes or operator subsidies. The Asha 311 is the most advanced of the three. The HSPA phone is powered by a 1GHz processor and has a 3-inch display, a 3.2-megapixel camera and a micro-SD card slot. The phone will cost $121 before local taxes or operator subsidies. On the software side, all future owners of the three phones will receive 40 games from Electronic Arts to download for free, excluding the cost of the data connection, according to Nokia. The games range across action, arcade and sports, and include titles such as Tetris, Bejeweled, Need for Speed: The Run and FIFA 12, Nokia said. Users can also browse the Web and choose between a number of options for email and chat. The Asha 305 will be available in the second quarter, while the Asha 306 and Asha 311 are arriving in the third quarter. Nokia has to compete with a growing number of cheap Android-based smartphones. For example, Vodafone recently launched the Smart II, an Android phone with a 832MHz processor, a 3.2-inch screen, a 3.2-megapixel camera and a micro-SD card slot. It can access the Internet using Wi-Fi and HSPA, and track the user's position with A-GPS. The phone runs Android 2.3 and will first go on sale in the U.K., costing £70 (US$108) with a pay-as-you-go subscription.